Only a week ago, the island was abuzz with activity, as the nation and visitors readied themselves for the celebration of Spicemas 2015. Netherlands Insurance, long-time supporter of the arts, once again stepped to the forefront and pledged support for a number of Carnival-related events in the lead-up to, and over the festival weekend. This year, Netherlands Insurance placed particular emphasis on the revitalization of ‘Fancy Mas’, however, its overall support included sponsorship for production of the Kaiso Bards Tent, the Kingman Calypso Tent by Ajamu, and the much anticipated pre-carnival shows produced by local promoters. These pre-carnival events included ‘Venus Artiste Lounge’ which gave artistes the opportunity to perform live, using acoustics only, and interact with a more intimately sized audience; ‘10 to 10’ by Mega Force Promotions and ‘Pree Day’ by the Jab Jab King, Tallpree. Since last year, the Company took its role in Carnival further, by partnering with the Kingman Calypso Tent. This initiative was the brainchild of Ajamu in an effort to revive Calypso Tents, which once played a significant role in Grenada’s Carnival. Netherlands also sponsored the countdown clock which was a new and welcome innovation to Spicemas events that aided artistes with their on-stage performances. The carnival celebrations culminated in an explosion of colours on 10 and 11 August, with a grand and newly revived Monday Pageant, and a vibrant street festival parade on Tuesday afternoon. The 2015 parade realised participation from a wide selection of mas bands, including several new additions, making the 2015 street festival one of the largest held in quite some time. Through sponsorships made to several mas’ bands, Netherlands embraced the Spicemas Corporation’s drive to emphasize Fancy Mas’. 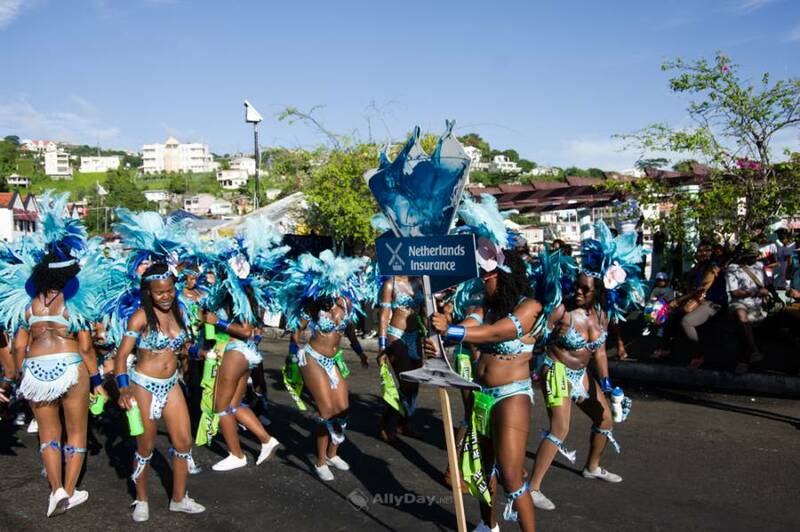 “Each year, Netherlands Insurance seeks out aspects of Carnival that can be contributed towards, and which help develop the performance aspect of carnival. We are pleased that through our contributions, a number of mas’ camps were able to successfully prepare for the street parades. I would like to commend the Spicemas Corporation for supporting and proactively seeking ways to re-energise aspects of carnival, such as the Pageant and Calypso tents, which play such a crucial role in the overall success of carnival. The Promoters, Mas’ Camps, Calypsonians, Soca Artistes, Steel Orchestras and Revellers, are also important in promoting and building Grenada’s carnival experience. I look forward to seeing a strengthened SMC, working full-time year-round to find new initiatives that enhance Grenada’s Carnival,” Mr Strachan further commented. On Carnival Monday and Tuesday, the public was treated to a score of artistic renderings from a number of Grenada’s mas’ camps. There were no holds barred as each of them, in all their splendour, competed for the coveted ‘Band of the Year’ title. Netherlands Insurance made noteworthy contributions to several of the mas’ bands which secured a number of the top placements for the Fancy Mas’ results. These included Andre Garvey & Associates, who captured the 2015 ‘Band of the Year’ title, and placed second in the Monday Pageant with the theme ‘Drink In’; LIME Commancheros placed second for ‘Band of the Year’, first place for Queen of the Band at Dimanche Gras, and first at Pageant with their rendition ‘Reflections of Africa’; RKD & Associates with Waggy T captured “King of the Band” and fourth place with ‘We Mas’ for both events. Netherlands also sponsored the SummerCrew Party Band, which catered to masqueraders who wished to play mas’ but did not want to participate in competition. This band also introduced regalia from international designers who created costumes for different sections of the band. Netherlands Insurance pledged its continued support to the arts and culture in their many forms and expressed their commitment to Spicemas 2016.